On most of our guided fishing trips we take short video clips, particularly if its a big battle with nice fish, or maybe something educational/informative, or maybe just something interesting in the outdoors. We see a lot in our time on the water, a good bit of it we’d like to share with you. On this page you’ll find a little bit of everything, we have a YouTube Channel that has all types of video clips and links and more. Also, we have additional ones on Flickr and HookTV. and also have had several appearances on local news stations like WXII NewsChannel 12, WFMY-2, and WGHP-FOX8. Below are some of our video clips. Check back often, as we post new stuff weekly. Be sure to check out our YouTube Channel, as we post video clips almost daily here including fishing footage, fly tying recipes, and more. You can check out a clip from our channel below and also visit our Channel here . On the channel can subscribe to our videos and receive them right to your inbox, as well as share them with family, friends, and co-workers. Here’s a short segment with Shannon Smith of WGHP Fox 8 that aired live on the morning news with Brad Jones and Cindy Farmer in July 2010. 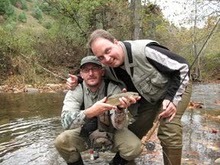 It was a feature on our Beginning Fly Fishing Classes at GTCC. Spent a nice morning at the Tying Bench with Roy’s Folks’ Roy Ackland and Roy’s producer David Weatherly. I have known David and Roy for years and have done previous segments with them about 20 yrs ago. David and Roy have won an Emmy Award for their work on the Roy’s Folks feature. On Stream Feature with WXIINewsChannel 12’s Austin Caviness…..